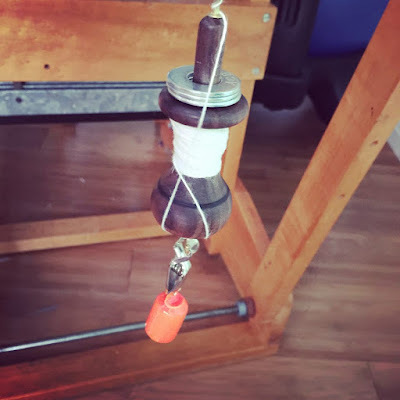 Well, I have come across a few hacks with my weaving lately. 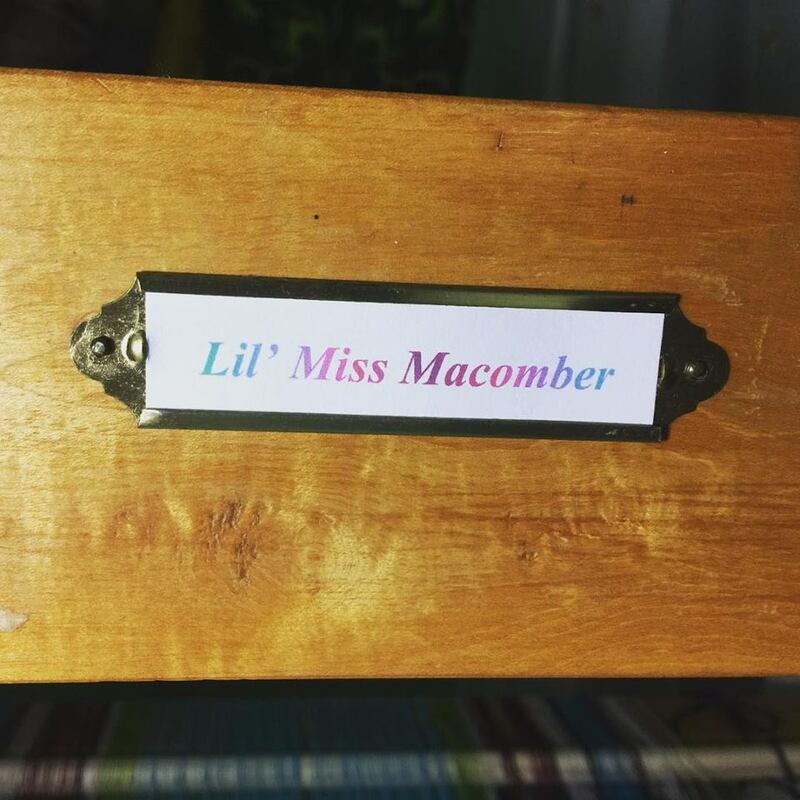 The smaller 32" Macomber (Lil' Miss) weighs approximately 200 pounds. When we moved her into the studio, we put felt on her feet to prevent her from scratching the wood floors. As I have been weaving on her, I noticed she slid forward as I beat. The Beast, her 56" larger sibling, is well over 400 pounds. He also has felt on his feet, but he hardly slides at all when in use. To keep Lil' Miss in line, I ordered four Leclerc loom feet from the Woolery. Camilla Valley Farm has them, too. While they are less expensive at $4 each (as opposed to $6.50/each), shipping is more from Canada. I was familiar with these, as I have had two different Leclerc floor looms. The feet on the Macomber are narrower, so the delightful husband had to trim the rubber feet to fit, then he attached them with two small screws, ensuring to countersink the screw head deep in the rubber to prevent them from scratching the floor. 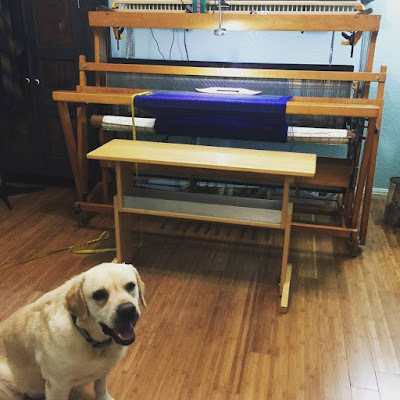 When he was done, I tried to move the loom by sliding it across the floor. It was like it was rooted to the floor. I wove on it and beat slightly harder than normal. The only drawback is now I have to get someone to help me pick up the little loom to move it into position for me to warp it, but that is really not a big deal. I had thought of putting the same rubber feet on the Beast, but after seeing how well they work, I decided against it. The Beast is hard enough to move when I want to slide it around. When I prepare a warp, I usually add floating selvages. Historically, I have added them to the warp, but lately, I have been adding them after the warp has been beamed, primarily because I like keeping a separate tension on them. Also, they are the most likely threads to break, and I just find them easier to use if they hang independent of the warp. For Christmas, one of my dear friends gifted me a pair of beautiful, handcrafted warp weights. The orange thing attached to the bottom is an ice fishing depth finder I acquired on Amazon. This gave me a little extra weight for tension on this thread. 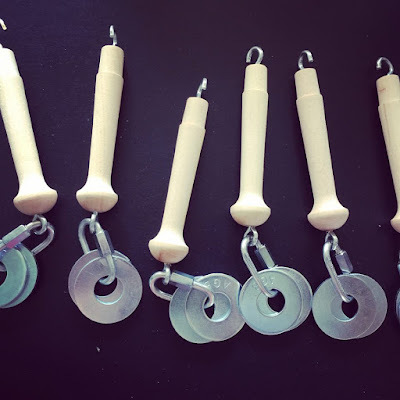 This is the link for the warp weights on Etsy. The warp weights are awesome! The way the thread winds around them makes it so easy to lengthen when they get close to the top of the back beam. I wanted half a dozen of them, but they are rather pricey. Instead, I showed them to the husband and asked if he could come up with something similar for me, after all, I have two looms, use floating selvages, and break warps all the time. On Saturday, he went to Home Depot where he bought Shaker pegs, cup hooks, large washers, and some quick-links. He actually looked for book rings, but Home Depot did not have any of those, so he improvised. I admit, they are not as gorgeous as the hand-turned ones, but they work perfectly. Bonus: all six of them cost about $10! 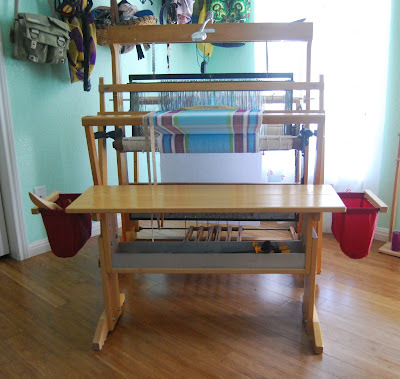 When I acquired my last Leclerc loom, I also bought a Leclerc weaving bench to go with it. In searching for a photo of both of them together, I realized I failed to get a good one before the loom and the bench went to live with a friend of mine (the same one who gave me the warp weights!). However, the left side of this photo shows both the Leclerc loom and bench in front of it. 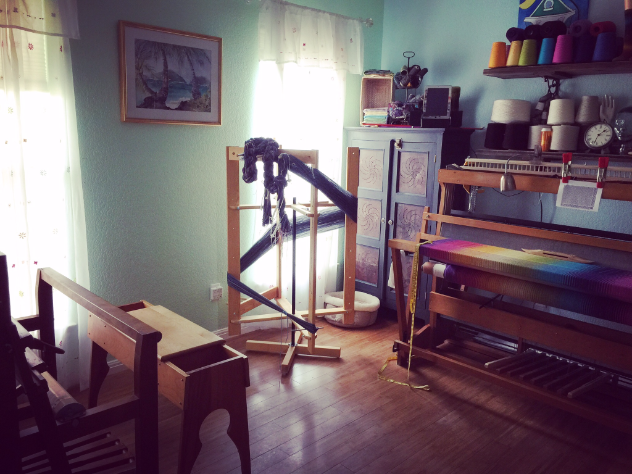 Updated as I found a better picture of the loom and bench! They worked together seamlessly, and I loved that the bench had a hinged top and two open storage units on either side. While the bench worked great with the Leclerc, it was a bit short in height and width for the larger Macomber. Once the Leclerc set moved to their new home, I ran across a used Macomber bench on Facebook someone was interested in selling. To date, it is the only Macomber bench I have found for sale (other than a brand new one from Macomber). Initially, the seller was not interested in shipping it, but when I told him I was willing to pay the cost of packing and shipping, he agreed. He was very nice. When he took it apart to pack it, he carefully labeled each join to make it easy for me to put back together. Here is what it looked like after we put it together. The husband's RitaMonster approved. Unlike the Leclerc, the Macomber bench was adjustable in height. Instead of side storage, it had a storage bin underneath the seat, which is helpful, just not as convenient. 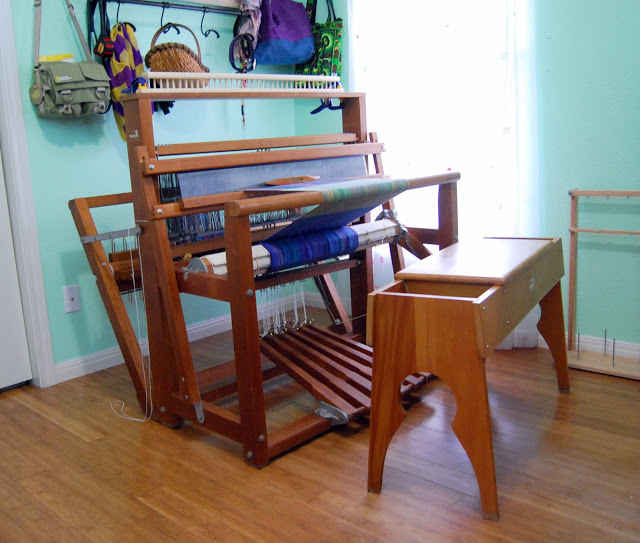 Once assembled, the husband adjusted it to suit me, and it has worked extremely well with both looms. However, I was still missing the side storage thing. 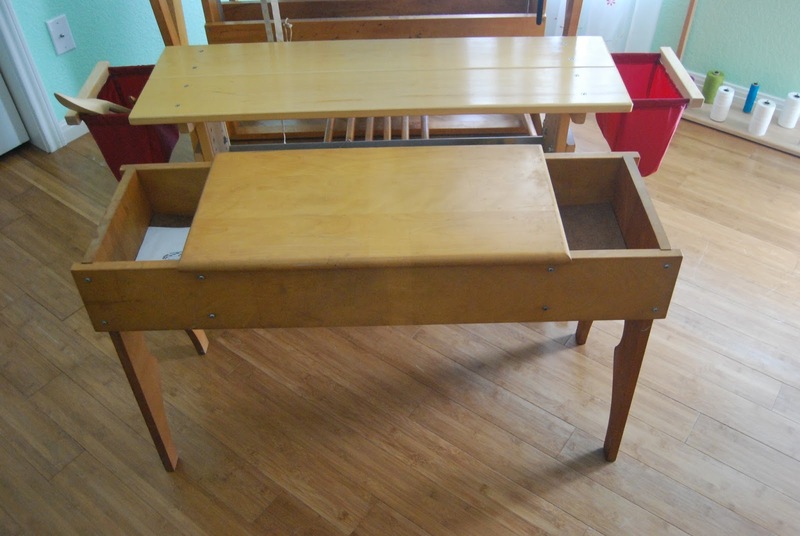 While I do not recall what brought these to my attention, I discovered Schacht made bags for their weaving benches. I bought a pair. 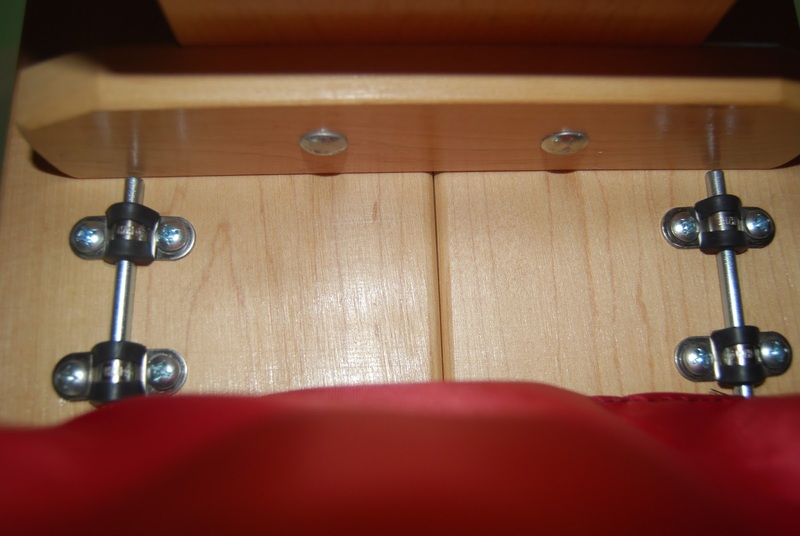 However, when they arrived, I realized the top of the bench was not thick enough to accommodate the steel rods that would attach them. 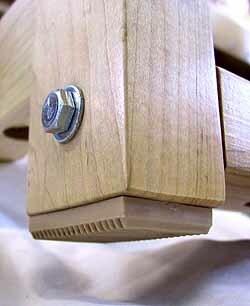 I put my thinking cap on and decided if I could find the right sized U-shaped saddle clips, we would be able to attach them to the underside of the bench. There was quite a bit of searching involved, but I eventually found them on eBay. They were listed as: 6mm Dia Rubber Lined U Shaped Stainless Steel Pipe Clips Hose Tube Clamp. They were also shipped from China and took weeks to arrive, but once they did, they worked! The bench in front of the smaller loom is a bit of overkill, but it is the perfect height for this loom, as well. I use the side bags for extra bobbins and shuttles. In the tray underneath, I keep a couple of clamps to attach the raddle to the castle, as well as superhooks for the treadles. It is perfect for the latter, as they are in easy reach when I sit on the floor to do tie-ups. Actually, I just remembered I have another Leclerc bench in my care, although it belongs to a good friend. Her 60" Leclerc Colonial 8 harness loom is presently in my dining room with a matching bench in front of it. Also, I added a comment below discussing how I think one could make one of those bench bags. While not a hack, I did add one little something to the smaller loom. When she arrived, she had a little brass name plate holder on the front of the castle. I assumed it was a holdover from her Oregon School of Arts and Crafts days and used to identify which loom was assigned to what student. I thought of removing it completely, but did not relish the thought of staring at two small nail holes in the center of the castle. Instead, I decided she might like to feature her own name, instead of the person weaving with her. I hope she likes it AND her name. As an afterthought, the bench bags would not be difficult to make. 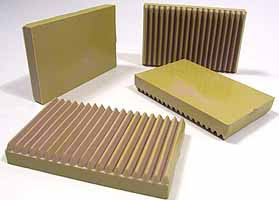 Each one would require two rods, a rectangular piece of wood, and material to make the bag itself. The bags are attached to the rods with a cuff that is folded over and sewn down, much like the top of a curtain panel. The rods slide through it. There are holes in the wooden handle to which the rods are tapped. The other ends of the rods could be secured in the bench via additional drilled holes or with clamps on the underside, as I did. I think you are incredibly talented!